Notes: Error bars indicate 95% confidence intervals. Among adults aged ≥ 65 years. Diabetes status was determined by a positive response to the survey question, “Have you ever been told by a doctor or other health professional that you have diabetes or sugar diabetes?” Women were asked not to include diabetes occurring during pregnancy. 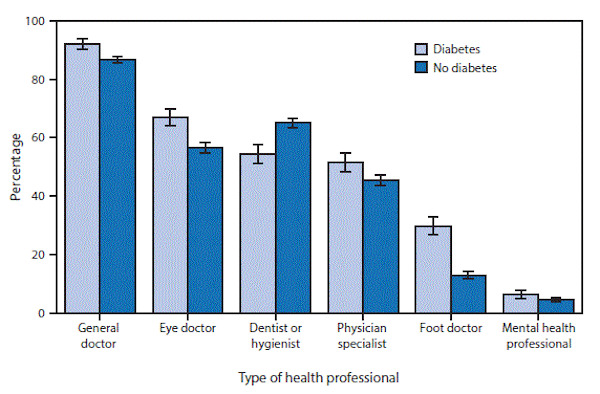 Data Source: National Health Interview Survey, 2015 data. This entry was posted in Medicine and Society Data Watch on May 24, 2017 by Genevra Pittman.